Posted on Tue, Mar 6, 2012 : 9:29 p.m.
Update at 11 a.m. Wednesday: Michigan linebacker Kenny Demens also tweeted at high school linebacker Mike McCray, writing after 9 p.m. Tuesday "@MJM92013 Welcome to the Maize & Blue my dog." Michigan alerted its compliance. A Michigan football program spokesman said Tuesday night the school's compliance department was notified after receiver Roy Roundtree possibly violated a minor NCAA rule. Roundtree, who will be a senior next year, tweeted earlier Tuesday to congratulate Ohio high school linebacker Mike McCray on committing to the Wolverines' 2013 class. “S/O to my lil brotha Mike McCray @MJM92013 for committing to Michigan today,” Roundtree tweeted. McCray attends Trotwood-Madison High School, which is Roundtree's alma mater. The two did not play together, although they know each other from McCray's recruitment in Ann Arbor. "NCAA rules do not allow comments about possible recruits on an institution’s social media page or a page belonging to someone affiliated with the institution. In addition, these pages cannot feature photos of prospects and messages cannot be sent to recruits using these social media technologies other than through their e-mail function." Michigan remains on probation after it was found in 2010 to have committed major NCAA violations under former coach Rich Rodriguez. The school was cited, among other things, for violating rules that govern practice time and off-field activities. However, the Wolverines are not expected to be punished heavily -- if at all -- for this infraction. After Notre Dame's Tyler Eifert committed a similar infraction last week, an NCAA spokesperson told the Chicago Tribune (without speaking directly of Eifert) that secondary violations are those considered "isolated" and "inadvertent" and offer "no competitive advantage." A request left for the NCAA late Tuesday seeking comment regarding Michigan's case was not immediately returned. McCray is a four-star linebacker who is ranked by Rivals as the country's No. 44 overall player. 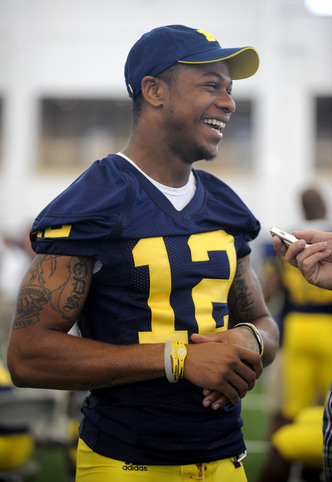 He is the 14th player to commit to Michigan's 2013 class. Roundtree has started 29 games for the Wolverines, including the past 24 in a row. He had 19 catches for 355 yards and two touchdowns last year, and 123 catches for 1,724 yards and 12 touchdowns in his career. He is projected to start next season. Thu, Mar 8, 2012 : 9:42 p.m.
&quot;secondary violations are those considered &quot;isolated&quot; and &quot;inadvertent&quot; and offer &quot;no competitive advantage.&quot; Much ado about nothing. Thu, Mar 8, 2012 : 6:11 p.m.
Kyle, The reference to Notre Dame's secondary violation is a bit of a red herring. They aren't the one on probation. If you want to draw a relative comparison, find another school on probation that had a tweeting issue. Frankly, we should be walking a tightrope in terms of rule compliance. I find comments summarized as &quot;yeah, but we're not as bad as them&quot; somewhat disturbing. This mindset will eventually get us in real trouble - mark my words. Thu, Mar 8, 2012 : 2:38 a.m.
Brady Hoke recently said something at a coaching clinic about not knowing anything about Twitter, Facebook, even e-mail (though he had to be kidding about the e-mail, right? ). I think if you want to be a head coach in this day and age, you need to be familiar with the current forms of social media your players might have access to. Even if you have a hard rule against your players using them (which, in my opinion, is a cop-out for the responsibility of monitoring your players in that medium), you need to be familiar with them. This is the first and I hope the only &quot;shame on you&quot; moment for Brady Hoke at U of M.
Thu, Mar 8, 2012 : 1:38 a.m.
Just proof that stupidity is not limited to the tattogate clowns. This social networking to kids now a day is comparable to what cocaine was to people in the 80s. You would think these idiots would know better after seeing all the carnage that has come from fools using their thumbs. 3 year bowl ban and a loss of 7 recruits each year for 5 years. That should be a good wake up call to tear him away from the local Chinese buffet and concentrate on keeping his players in line. Thu, Mar 8, 2012 : 2:46 a.m.
your twitter account is past due AGAIN, no more social networking for you!! but there is hope you can alway's GO BLUE!!!!!! Thu, Mar 8, 2012 : 2:39 a.m.
Did you just compare Twitter to cocaine and call people who use social media &quot;idiots&quot;? Wow. Thu, Mar 8, 2012 : 12:33 a.m. Wed, Mar 7, 2012 : 10:43 p.m.
Much ado about nothing! GO BLUE! Wed, Mar 7, 2012 : 9:59 p.m.
Didnt ohio state commit the same violation THIS year and not report it?Travis Howard tweets Cam Burrows and Eli Woodard with the same message. Wed, Mar 7, 2012 : 9:46 p.m.
What a joke. A congratulation tweet after a verbal commit. NCAA needs to go after the real offenders. SEC and Ohio with the SEC coach where they both over recruit and leave kids out to dry or drive them off to free up scholarships. Wed, Mar 7, 2012 : 8:54 p.m.
prety stupid for a school that prides itself on intelligence. What a joke. Wed, Mar 7, 2012 : 8:26 p.m.
Come on! What's the big deal? There are probably much more serious violations at U than this one. Somebody got ticked off about this particular recruit's decision. Wed, Mar 7, 2012 : 7:44 p.m. Wed, Mar 7, 2012 : 7:14 p.m. The question now is when are we going to take our bowl ban ? Thu, Mar 8, 2012 : 4:35 a.m.
By our, you mean your team and coaching hero down in cbus? They already took their bowl ban. 1 year ban. Wed, Mar 7, 2012 : 5:25 p.m. The NCAA is a JOKE. Wed, Mar 7, 2012 : 6:03 p.m. Wed, Mar 7, 2012 : 4:27 p.m.
As some suggested, it is good to have this out in the media and open so as to keep our guys informed on what they can and cannot do. I also like the 2000 page NCAA rules book being 1800 pages too long. IMO: Very stupid NCAA rule. The Thought Police are out there. tweet to the NCAA: Update your outdated rules. tweets like those are harmless. The rule was written long before facebook and twitter. Athletes send out thousands of tweets each day, and this one was just as innocuous as any. So Roundtree can't congratulate a kid from his former high school because he is &quot;linked&quot; to the institution. It is surprising when the NCAA does anything right, but declaring it inconsequential with no competitive advantage is the right thing to say, if they have to get involved at all. Wed, Mar 7, 2012 : 3:43 p.m. The compliance department had to be notified? Isn't it supposed to be the other way around. Brandon is a hack. I see big trouble down the road if he can't step up his game. There is more to being an AD than marketing your crappy team. Thu, Mar 8, 2012 : 4:31 a.m.
Crappy team?? 11 wins including one over the nut jobs in cbus. If that makes them a crappy team how would you define your 6-7 bucknuts? Wed, Mar 7, 2012 : 6:08 p.m.
who ever said no child left behind has not read some of the posters on this blog!!! GO BLUE!!!!!! Wed, Mar 7, 2012 : 3:52 p.m. Wed, Mar 7, 2012 : 2:35 p.m. It's better than a cover-up now, and an unintended &quot;reveal&quot; 6 months down the road. Admitting your mistakes from the get-go is almost always the best path to follow because when it does come out (and it will), it's even uglier. The NCAA - a mega-million dollar company that refuses to pay its employees. A GOP dream. Wed, Mar 7, 2012 : 1:48 p.m. In my opinion the 2000 page NCAA rule book is about 1800 pages too long. (hyperbole folks don't anyone tell me book is actually 1897 pages) Most of the crapola in it is to justify their multibillion dollar existence. Wed, Mar 7, 2012 : 12:24 p.m. I don't know if this is worse then with Ohio State and Jim Tressel knowingly playing ineligible players and trying to cover it up or someone saying congrats for committing to going to a school. I watched Roundtree make that game winning touchdown catch on the Big Ten Network last night against that Independent Catholic Church school with a swearing mad man coach; I almost cried that was such good game at night in the Big House! GO BLUE! I always wondered how NCAA regulations trump the constitution of the United States? Has NCAA ever heard of free speech? I'd like to see this one tried in Federal court, and I bet the NCAA would get a spanking. Still, when our national leaders have been wiping their rears with the constitution for the past 20 years, it's no surprise the lower level despots follow suit. Thu, Mar 8, 2012 : 2:34 a.m.
Freedom of speech means freedom from prosecution. This has absolutely nothing to do with the 1st amendment. There is no First Amendment issue here. Not applicable. And no, it would never even make it to federal court. The 1st amendment applies to the government, not non-governmental companies and organizations. Wed, Mar 7, 2012 : 9:52 a.m. I'm glad they reported it, but the NCAA is a joke. The profits made on the backs of these guys and now they can't swap tattoos or even tweet? Stupid if you ask me. It's the school's television deals and profits that make these young men famous and they can't act on it. It's like when your mom made cookies and wouldn't let you eat them until after dinner. It just isn't fair. Wed, Mar 7, 2012 : 7:12 a.m.
Watch out! Rosenberg and Snyder are pulling an all-nighter on this one, for sure!!! Wed, Mar 7, 2012 : 7:24 a.m. Wed, Mar 7, 2012 : 6:11 a.m. Wed, Mar 7, 2012 : 5:32 a.m. Wed, Mar 7, 2012 : 5:14 a.m. Wed, Mar 7, 2012 : 4:23 a.m. I actually heard from a friend who was at a bar with a guy who knew somebody that it was Urban Meyer who made that tweet. Wed, Mar 7, 2012 : 4:06 a.m. The headline says this is a &quot;minor&quot; violation. Is that as defined by the NCAA, or is that our own view of the violation? I'm just curious because we have a track record of downplaying our own violations and upplaying (is that a word) other teams'. We just couldn't let the OSU and MSU violations go could we, while the RR violations were just faux pas. So just curious, does NCAA have major and minor violations, like felonies and misdemeanors? Wed, Mar 7, 2012 : 4:38 a.m. Wed, Mar 7, 2012 : 4:33 a.m. Wed, Mar 7, 2012 : 3:46 a.m.
pretty crappy rule if you ask me. Its a violation, but minor and wont get any punishment. the NCAA better figure out a way to to deal with social media. Social media is a huge challenge for college athletics. Wed, Mar 7, 2012 : 3:08 a.m. I believe this is a good article because it is an awareness cause. It is an NCAA rule, no matter how minor - it is a rule. I honestly believe Roundtree was not aware of this rule and I believe many other players are not as well. This is what college education is all about - you can beat the entire team is aware of this now, and every new recruit as well. This is why I believe the NCAA will not penalize, but issue a strict warning and know Michigan will take the appropriate steps that make them the nations leader. MgoBlueForTiM......Roy Rountree is a class act, and has grown even more after today. Wed, Mar 7, 2012 : 3:03 a.m. Uh oh...we're already on probation....now we're SCREWED!! Wed, Mar 7, 2012 : 7:13 p.m. This most likely means we are probably going to take a few less players this year due to a few losses in scolarships. Wed, Mar 7, 2012 : 3:09 a.m.
Are you michigan state ? or ohio ?